JAKARTA, Indonesia (CNN) -- Indonesian authorities found 198 refugees from Myanmar early Tuesday off the country's west coast who claimed they had been drifting in a wooden boat for three weeks after being set adrift by Thai military forces. 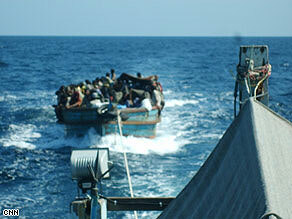 This picture provided to CNN is said to the Thai army towing refugees out to sea. A survivor told Indonesian immigration officials that his boat was part of a group of boats carrying about 1,200 people who were cast out to sea by Thai military forces who had found them. "They were part of the nine boats containing Rohingya refugees from Myanmar and Bangladesh that were set adrift by the Thai security forces," said Iwan Riyanto, an Indonesian immigration official. The survivor also said 220 people had been on his boat, but 22 died, Riyanto said. An official with the Sabang Region Navy also told CNN that the survivors on the boat said they were set adrift by the Thai military. The discovery comes after allegations arose a month ago that a group of Myanmar's Rohingya minority -- who have been fleeing their homeland for years, saying they are persecuted by its military government -- had been dumped at sea by Thai military authorities. CNN also interviewed a refugee who said he was one of the few who had survived after a group of six rickety boats was towed back to sea and abandoned by Thai authorities earlier this month. The source defended it, saying that each boatload of refugees was given sufficient supplies of food and water. That source said Thai villagers had become afraid of the hundreds of Rohingya arriving each month, and they had accused the refugees of stealing their property and threatening them. The Thai government has said that "there is no reasonable ground to believe" that the Rohingya were fleeing Myanmar because of persecution. "Their profile and their seasonal travel further support the picture that they are illegal migrants, and not those requiring international protection," the Foreign Ministry said in a statement issued in late January. One of the refugees who came ashore in late January said they would be killed if returned to Myanmar because of their minority status. He said the Rohingya are stateless because they lack bribe money to obtain identification cards in Myanmar. The discovery comes nearly a week after a judge in Thailand fined dozens of other Rohingya refugees from Myanmar who pleaded guilty to charges of illegal entry after fleeing their homeland in December. CNN's Andy Saputra and Dan Rivers contributed to this report.